You can request to join a Dropbox Business team by submitting a membership request. The admin of the team can then accept or deny your request. Any Dropbox user with a verified email address on a company domain can request to join a team. If you've already been invited to join a Dropbox Business team, you'll need to accept your invitation. Click your name in the bottom left corner. Enter your work email address (if you have one), and click the Get started button. If a team exists on the domain you enter, you will be prompted to join it. If a team using your company domain already exists, you’ll see a prompt to Join Team. Note: You will need to wait for the admin to approve your request to join. Once you request to join a Dropbox Business team, an email request is sent to the Dropbox Business team admin, who can approve or deny this request. If the admin approves the request and the team doesn't have enough open licenses, the team is billed for an additional license. If there is a Dropbox Business team on your company domain, Dropbox Basic and Plus users can request to join that team. If there is more than one team on a domain, users can see all available teams, but can join only one of them. 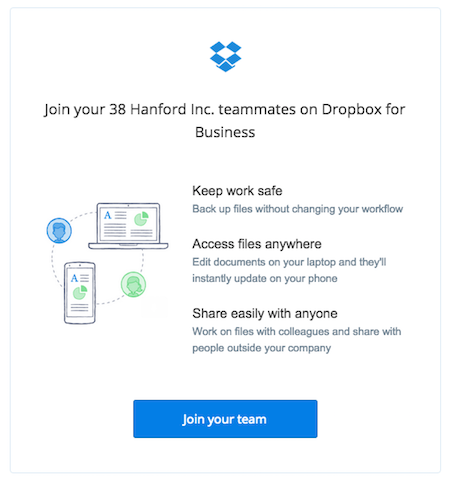 Locate the email invitation to join your team's Dropbox Business account. Click the Join your team button. Set up your work Dropbox by filling in your name and creating a password. Agree to the Dropbox terms and click Create account. Once your account it set up, learn more about your account with our business user-guide. If your company has enabled single sign-on (SSO), you’ll follow a similar path. However, you’ll also be asked to sign in to your SSO provider, which uses your work email address and password. If you have any issues signing in on a page that is not the Dropbox website, check with the admin of your Dropbox Business team. I received a team invite to my personal email address—what should I do? A Dropbox Business invitation will only work for the email address it is sent to. If you do not want to use your personal email address for your Dropbox Business team, your team admin can cancel the initial invitation and resend it to your work email address.